The Aequitas toolkit is a flexible bias-audit utility for algorithmic decision-making models, accessible via Python API, command line interface (CLI), and through our web application. Use Aequitas to evaluate model performance across several bias and fairness metrics, and utilize the most relevant metrics to your process in model selection. Our goal is to support informed and equitable action for both machine learnining practitioners and the decision-makers who rely on them. Biased actions or interventions that are not allocated in a way that’s representative of the population. Biased outcomes through actions or interventions that are a result of your system being wrong about certain groups of people. The set of individuals in the above population that your risk assessment system recommended/ selected for intervention or action. It’s important t this set come from the assessments made after the system has been built, and not from the data the machine learning system was “trained” on if you’re using the audit as a factor in model selection. 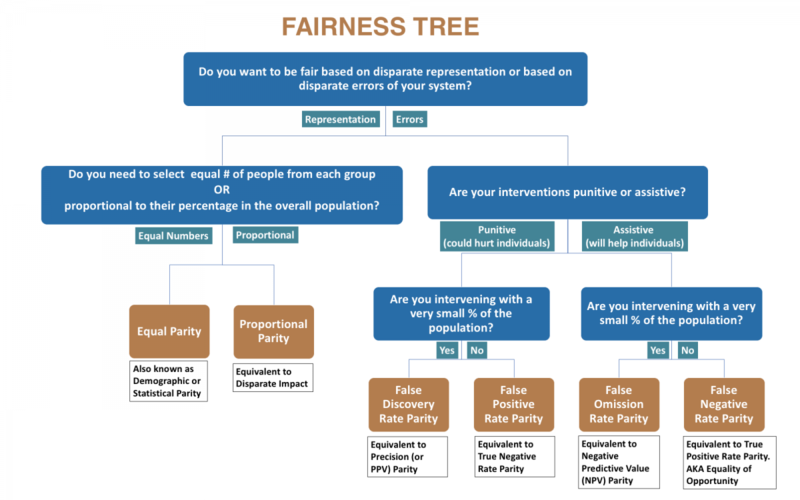 If you want to audit for biases due to model or system errors, you also need to include actual outcomes (label values) for all individuals in the overall population. The Bias Report produces a pdf that returns descriptive interpretation of the results along with three sets of tables. Additionally, a csv is produced that contains the relevant data. More information about output here. In the command line you will see The Bias Report, which returns counts for each attribute by group and then computes various fairness metrics. This is the same information that is captured in the csv output.